Borneo people in South Kalimantan has a unique tradition. They use boat, on the big river, to trade the groceries, meats, rice, and so on. They called it floating market. But, I never knew that in Bandung, West Java, there is a floating market too. Even I had been a citizen of Bandung for at least two decades. So, I browse on Internet. And yes, there is! However, the Floating Market in Bandung is only a brand and the artificial one. It was developed completely for tourism. There, you will not see people trade any staple like in Bornean floating market. Yet, it’s interesting to visit. 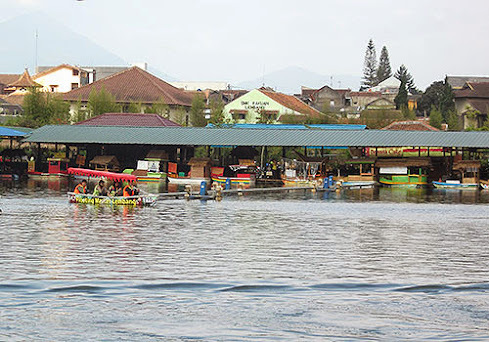 Bandung’s Floating Market was officially opened for public on December 12th, 2012 on a 7 hectares area around the lake Situ Umar. It is located at Grand Hotel Lembang 33E Street, Bandung, near Pasar Panorama (Panorama Market). If you reach this place by angkot, just ask the driver. He will take you there or at least give you the direction. In the weekend, people said the Floating Market could be so crowded. Fortunately, we went there in the weekday when this place looked quiet, at least, from the outside. But when we entered the Joglo-like (Javanese traditional house) terrace, it was crowded already by tens of guests. I couldn’t imagine how many visitors here in the weekend? They came for many reasons. It’s cheap, maybe. FYI, the ticket just costs IDR 10,000 per person, IDR 15,000 for weekend. Children under 5 is free. After all, you can change the ticket with a glass of free welcome drink: hot coffee, hot chocolate milk, or ice lemon tea, which I think values IDR 5,000. By the time we entered the area, we knew that we came to the right place. The Floating Market is plenty, tidy and lovely. 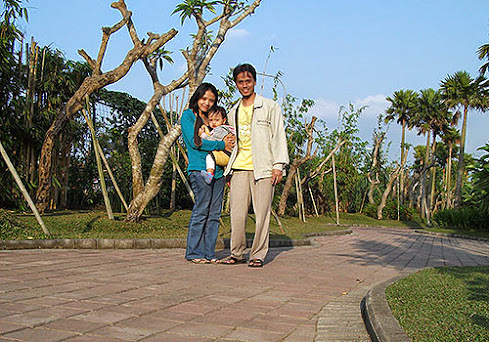 Here, you can ride the water cycle, row the canoe or boat, stimulate your adrenaline with flying fox or ATV, feed the swan or the rabbit, or just walking and taking the picture at Stone Park or mini rice field. To experience some of those entertainments, you must pay again. Not with the real currency, but with Floating Market’s coins: yellow coin (you can buy it with IDR 5,000), blue (IDR 10,000), pink (IDR 50,000), and orange (IDR 100,000). There are money changer kiosks in some corners. The coin you have bought cannot be returned or resell like in forex. But you can reuse it whenever you come back to the Floating Market. Kiara, our two year old daughter, loves animal. So we headed directly to the breeder. Unfortunately, the Goat House was under construction. But the Goose Park was open. My daughter was hysterically happy seeing the beautiful geese swimming on the small, beautiful lake. When we walked on the waterfront, they made a noise as hoping us to feed them. Kiara really adored their attitude. Then, she gave them food we bought there with a yellow coin. Next, we rode the water cycle around the lake for 30 minutes. It cost us a pink coin. Expensive, huh? A little. But it’s normal. And fun, anyway. Before we jump into the water, we had to wear the lifebelt, including Kiara. Just in case we fall down to the lake. Riding this vehicle is not so hard. We just have to cycle the pedal by feet and steer it by hand. Turn the stick left if you want it go right, and vice versa. It’s pretty easy to control. But we found some difficulty at the beginning. It is because my husband took Kiara on his lap and our backpack, while he was also taking the pictures around the lake. We could not entrust that backpack to anyone as the staff asked us to bring it along. 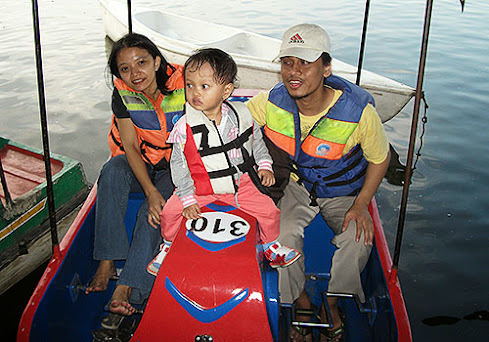 After a while, we thought that Kiara better sit on the middle of the boat while my husband and I keeping the backpack and taking the picture by turns. Problem solved. Then came another difficulty when we were trying to pass the small canal between lakes. The canal is large enough. But to pass it, your water cycle must be in vertical way. We were there a little diagonally, and get worst, it became horizontal. So, we stuck there! Back and forth seemed to be useless, we asked for help to a patrolling staff. He manipulated our water cycle by hand. And voilà! Free again! Few minutes later, another problem happened. We wanted to take picture of the floating garden that splits a pool lake to another. The garden is only one meter width and tens meter length. We pedaled there. Suddenly, the wind blew against us. Since the garden floats on the water, it then moved toward us. Fast! Our eyes bulged out. We were just afraid it would hit our water cycle, then we would stuck to those bushes, and our vehicle would lose the balance and sink. So abruptly, we changed direction and were pedalling faster to avoid those long, speedy garden. Hahaha, it was really thrilled. Tired of 30 minutes riding, we landed. Then we enjoyed the menu sold on the boat in side of the lake. There are various snacks especially sundanese snack, such as baso tahu (tofu cooked with starch dough), colenak (fermented tuber served with sweet sauce made from brown sugar and scraped coconut), tahu lembang (Lembang’s tofu), surabi (a kind of pancake made from rice fluor), lotek (vegetable salad with nut sauce), etc. The prices are various, from IDR 5,000 for the snack until IDR 35,000 for the main dish. Well, it was late afternoon already. We went to the musala (small mosque) to take a prayer. There are a lot of musalas in Floating Market. They all are clean and comfortable. So for muslims, don’t worry. You wouldn’t lose any prayer time, even when you are here all day long. In the weekday, the Floating Market opens from 10.00 to 18.00. While in the weekday, it opens from 9.00 to 22.00. I suggest you to come earlier, so you’ll have a longer time to play around with your beloved.